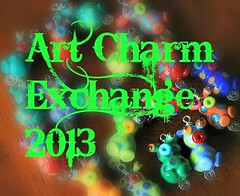 I think the peacock bead I used in my Art Bead Scene challenge cuff this month turned out pretty well. Not perfect, but a totally respectable representation of a peacock. First of all, you can tell it's supposed to be a peacock. That may seem like ridiculously obvious criteria, but if I can show my 3-year-old a bead and he can tell what it is, then I feel like I've achieved a pretty significant milestone. The colors of the tail match the picture, as do the eyes in the feathers. 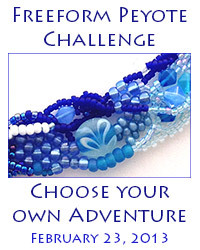 That's another important criteria to me when making a bead that's supposed to be a part of a picture-inspired design. It looks like there are layers of feathers, and the bird is proportional, and the glass bead itself is shaped on the top to add visual texture to the feathers at the top giving the bead some depth and complexity. It wasn't always that way. It took me five attempts to get to this bead and the first four were ... well, crap. Obviously, as an artist, I know that's what it takes to end up with a final product you're proud of. 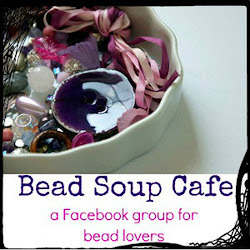 But, I thought I'd talk a little about what I learned with each bead "failure". 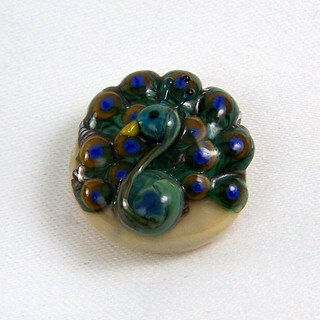 The main challenge in the first four beads was finding a cane - a composite glass rod, made up of multimple colors of layered glass - that would produce the look I needed for the feathers. At first I was concerned with getting the cream color behind the feathers, so I was using an ivory base for my cane and applied stripes of teal green to the cane to create the fringe on the feather. The trouble here was, first, that I didn't cover the ivory glass with clear before adding the green stripes and the sulphur in the ivory reacts with the copper in the green and creates a dark border between the two; so with the thin stripes of green the dark border consumes the green. After the first bead I knew that the way I made the cane wouldn't work, but I wanted to see how raking the cane once it was on the bead changed the way the feathers looked. As seen in the second bead, it did seem to make the feathers look more 'feathery,' but it also make them darker. In successive cane attempts I tried making the stripes thicker and encasing the bottom layer of ivory, but that didn't end up changing the result because the green was still reacting with the ivory base, which also wasn't encased, which you can see in bead three. At the same time, the third and fourth attempts were geared at feather decoration and making the feather eyes look right because my attempt in bead two is something you wish you could unsee. As for the feathers, I was trying to use up the feather cane and ignoring that it wasn't what I needed. When talking to my husband, he suggested that I switch the colors; that the green should be the dominant color, and he was right. So, when I made my green cane, I encased it in emerald transparent before adding stripes of ivory encased in topaz transparent - so that they would not react together nor with my ivory base. While the ivory did end up disappearing in the final application, it did darken the glass where it was, so it helps create definition and variation that exists in feathers. I did add some of my old cane beneath to add some of the light feather definition you see in the upper portion of the feathers, but that ended up getting covered. Other changes I made in the last version was that the base ivory was encased to prevent reaction with any of the other glasses. This bead design may be something I revisit in the future and continue to fine-tune. But the take-away from this experience that I wanted to share is, if a bead design doesn't work out for you, learn from it, practice other things, come back and keep at it. A 'failure' is only bad if you don't learn from it. We all know that's true in life, and it's also true in lampworking!